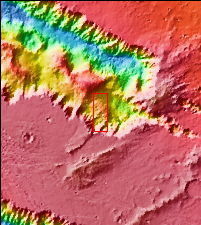 This VIS image shows part of the eastern end of Candor Chasma. The edge of the canyon is at the bottom of the image. The slopes of the chasma a eroded into a series of ridges and valleys. Winnowing of unconsolidated sediments by long term unidirectional winds can create these features. The ridge and valley system is called a yardang.